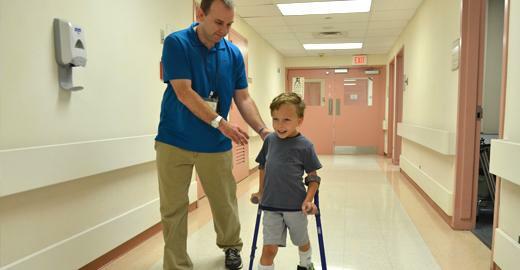 The Tone Management & Mobility Program is part of the comprehensive rehabilitation services offered in the Department of Physical Medicine and Rehabilitation to treat children and adults with spasticity secondary to cerebral palsy, spinal cord injury, traumatic brain injury, multiple sclerosis and stroke. We also treat infants with torticollis, plagiocephaly, and brachial plexus injuries. People of any age with developmental and motor impairments are welcome in our clinics. What you should expect from your visits? Your visits to our clinic will be primarily evaluation and reassessment as well as suggestions for equipment, therapies, exercises and other activities that will help your condition. You will have an evaluation by a team including a physician and a physical therapist. Please bring any orthotics (braces) and wear clothing and shoes appropriate for your mobility. Effectiveness of treatments for children and adults with neurological disorders. Spasticity, developmental disabilities, brachial plexus injury, neurological disorders.